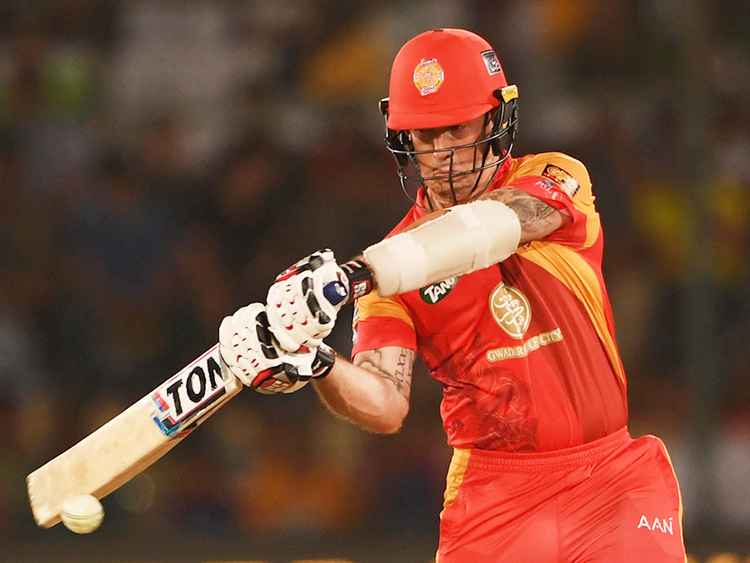 KARACHI, Pakistan: New Zealander Luke Ronchi entertained cricket-starved fans in Karachi with a blistering half-century as he anchored Islamabad United to a three-wicket win over defending champion Peshawar Zalmi in the Pakistan Super League final on Sunday. Islamabad, which won the inaugural PSL in the United Arab Emirates in 2016, raced to 154-7 in 16.5 overs with Ronchi hitting 52 off 26 balls, including five sixes and four boundaries. Peshawar had earlier struggled to 148-9 in Pakistan's biggest city after captain Darren Sammy won the toss and opted to bat first but their star batsman in the tournament, Kamran Akmal, fell for only 1 in the third over. Chris Jordan gave Peshawar a glimmer of hope when he removed Ronchi (52) and captain JP Duminy (2). But little-known Asif Ali (26) smacked three successive sixes off Hasan Ali, and then Faheem Ashraf (6) raised the victory with a six off Wahab Riaz. "I'm pretty confident that this will be the start of cricket coming back to Pakistan," said Duminy, who led Islamabad in the absence of injured regular captain Misbah-ul-Haq. "I've certainly enjoyed my time here ... and I'm sure you will see lot of us here back next year." Spectators endured long queues and navigated stringent security checkpoints to witness a high-profile cricket match in this southern port city, hosting a game of such stature for the first time in nine years. At least 8,000 security personnel that also included armed soldiers guarded the 27,000 capacity National Stadium with Prime Minister Shahid Khaqan Abbasi among spectators. Ronchi finished as the tournament's leading scorer with 435 runs in 11 matches. "It's (the PSL final) giving a message to the world that Pakistan is a peaceful country and Pakistan will play a role in sports," said 24-year-old spectator Hamza Yousuf Shah, who was waiting in one of several long queues to get into the stadium. The five main roads leading to the stadium became a no-go zone for anyone without a ticket eight hours before the final began at 8 p.m. local time. Spectators had to use a shuttle service before walking more than a kilometer to go through two security checkpoints. Karachi, which has a population of 15 million, last hosted a major game featuring international players in February 2009 - a test match between Sri Lanka and Pakistan. Later on that tour, on March 3, 2009, the Sri Lanka team bus taking the visitors to play the third day of the second test was fired upon by 12 gunmen near Gaddafi Stadium in Lahore. Six Pakistani policemen and two civilians were killed, while six members of the Sri Lanka team were injured. The incident resulted in a halting of international cricket in the country, forcing the Pakistan Cricket Board to play abroad with the United Arab Emirates as its "home" for hosting international teams. However, the Pakistan Cricket Board has been trying to convince countries to begin touring Pakistan again. Lahore first hosted the PSL final last year as well as three international Twenty20 matches against a World XI and one against Sri Lanka. But some international PSL players remain reluctant to play in Pakistan. Preliminary PSL matches were played at Dubai and Sharjah in the United Arab Emirates. Shane Watson (Quetta Gladiators), Eoin Morgan (Karachi) and Kevin Pietersen (Quetta) all declined to accompany their respective franchises to Lahore earlier this week for two PSL elimination matches. "Pakistan is full of cricket fans and it's a great thing that cricket is back in Pakistan, hopefully it will be a success," said 16-year-old cricket enthusiast Ria Martin. Love of the game also brought 14-year-old Maaz Ahmed to the ground. "I had always wanted to see star players live in action and today my dream will be fulfilled," he said. "I simply can't describe my excitement in words, I just want the final to begin." Other spectators carried placards proclaiming "No Fear, play here" in support of Pakistan's bid to regain the confidence of foreign teams. Peshawar was led by West Indian Sammy. Local Pakistani singers, led by Ali Zafar and Shahzad Roy, headlined an hour-long musical show before the toss. Sammy joined the musicians on stage where he showcased his dancing skills with teammate and fellow West Indian Andre Fletcher and fast bowler Hasan. "You have to come back again, fill the stadium and show the world that we are again ready for international matches," Sethi said.